On a beautiful summer’s day we welcomed three visitors from the Cassel who wanted to learn from us how to set up a similar service. 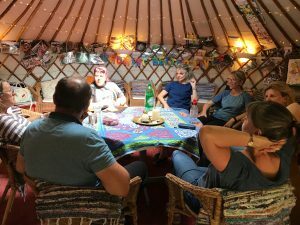 Their initial experience on arriving at the site and entering the yurt? “So completely peaceful” and “so unexpected and overwhelming”, then “its about people and plants – and lovely to meet such special people – a genius loci*“. Lots of difficult stuff in check-in but the group’s understanding, strong support and feedback helped ground us for the day ahead. After a comfort break we split into two groups – one to “smash and grab” trip for bread which someone (not naming Hils!) had forgotten for lunch and the others toured the site. 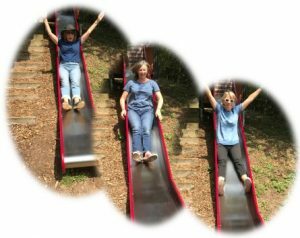 So many fascinating things to admire – the Bug Hotel, fire pit, our amazing maze, the rain forest tunnel and, as always, finishing off on the slide!